Cooking is art but cleaning the stove can be a real pain. No matter how hard we try not to drop anything while cooking, one way or another, things end up spilling and burning on the stove top. But when you have the best cleaner for stovetop grease at home, you can carry on with all your cooking experiments without much concern. Below you will find a few homemade degreasers as well as read reviews of great products, such as the Weiman Glass Cook Top Cleaner & Polish, you can get from Amazon now! Gradual deposition of grease and gunk reduces the efficiency of the stove. Often plain water doesn’t work enough to clean clutter. So here are some simple ways to keep your stovetop shining like new even if you do not have any commercial stove top cleaners at home. You may or may not need to follow all of these steps depending on the toughness of stain. Read the instruction manual that comes with the stove top carefully before applying anything to clean the stove top grease. Being educated about the type of product you are using, and the do’s and don’ts of it can help you keep your appliance safe and efficient for a long time. The instruction manual may even recommend the product that works best on your stove. Safety first: Before you start cleaning your stove, make sure that the fuel connection/electric connection is turned off. Let the stove top cool down completely. Also read: How to get bike oil out of clothes. 1 How do you clean a burnt glass stove top? 2 How to remove grease stains from a gas stovetop? 3 How to remove baked-on grease from glass stovetop? How do you clean a burnt glass stove top? Take lemon juice and white vinegar in equal proportions in a bowl and mix them. Lemon and vinegar solution act as best grease remover. If you have a spray bottle at home, put the lemon-vinegar solution into it. Spray the mixture over grease spots and wait for ten minutes. The lemon-vinegar mixture will soften the burnt-on gunk. Using a damp cloth, scrub the area briskly. If the burnt on grease is too stubborn to come off, try the next step. Wipe the greasy area with a damp cloth. Sprinkle some baking soda over the stove top covering the stained area well. Let the baking soda take care of the stubborn grease for five minutes. Scrub the area again with a damp cloth or scrub sponge. If you still don’t get the required result, you can try the next method. Take half cup of Coca-Cola and pour it over the burnt-on mess. The phosphoric acid present in the beverage breaks the tenacious grease making it easy to eliminate. After 5 minutes, scrub the area with a damp cloth. If the stain persists, you can try the next step. Take steel wool and put some soap on to it. Scrub the steel wool vigorously on the areas covered with burnt-on grease. Find more tips for cleaning black stovetop here. How to remove grease stains from a gas stovetop? Clean the holes of the burner using a sharp needle or safety pin. Make sure to turn off the gas connection before starting the cleaning process. Burners often get clogged by dripped oil, spilled milk, sauces or other food particles that we drop on it accidentally while cooking. Regular cleaning of burners keeps the efficiency of your gas burners maintained. Using a toothpick or twig for cleaning a clogged burner can be a bad idea. Remove all detachable parts of the cooktop. Put them in a container filled with hot water and dishwashing soap. Let them soak for some time. In the meanwhile, clean the rest of the areas of the cooktop. If the greasy buildup on the cooktop surface is very tough, you can apply baking soda mixed with water in equal proportion to it. After applying baking soda, scrub the dirty area using steel wool or scrubbing brush and rinse it with plain water. Wipe with a clean damp cloth. Avoid using any cleaner spray directly onto the burner. How to remove baked-on grease from glass stovetop? Baking soda and white vinegar are two everyday household products that possess excellent cleaning properties. Contrary to the expensive cleaning products, these two items are very cheap and you can find them in any kitchen. Turn the switch off and let the glass stove top cool after cooking. Spray some white vinegar on the surface of the glass top. After 2-3 minutes wipe it with a clean damp cloth. Sprinkle some baking soda over the dirty cooktop. Because of its alkaline nature and abrasive quality, baking soda acts as an effective cleaner. Take a big towel and dip it in hot water. Now squeeze it and cover the entire stovetop with this warm, damp towel and leave for 15 minutes. Use elbow grease and baking soda to clean the stove. Wipe it clean with the damp towel. You can also use a razor blade to scrape off more stubborn burned on crud. Be careful not to damage the surface of the glass stove top while scraping it. Wipe the stove once more with white vinegar and rub it dry. Weiman Glass Cook Top Heavy Duty Cleaner & Polish has a biodegradable formula that easily removes burned on grease from glass stovetops. This makes it the best degreaser for stove tops that we’ve ever used. It cleans, shines and protects the top. Very easy to use. Just put some of the product and gently rub it all over the surface. Let it sit for a few minutes and run the surface with a razor blade. It will help remove the most stubborn baked on stains. Use a clean cloth to clean the top. Weiman’s Cook Top Cleaner is a great product that will save you a lot of time and scrubbing. Click here to check the current price on Amazon. It is a non-abrasive stovetop grease remover formulated especially to remove thickly burnt on grease buildup from ceramic cooktops. 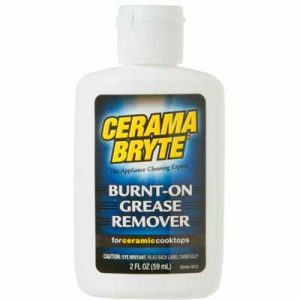 By using a few drops of Cerama Bryte Burnt-On Grease Remover, you can keep your ceramic cooktop shining like new. Just apply it directly to the area that you need to clean. Leave it for some time, then wipe it by gently rubbing with a washrag or cloth to find a bright and shiny cooktop. Click here to check the current price on Amazon. 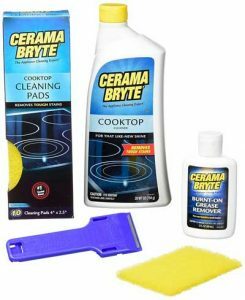 Cerama Bryte created a special cleaning kit with all the necessary products to keep your stovetop clean and grease free. It contains the amazing ceramic cooktop degreaser for daily cleaning purpose, a scraper to remove thick, tough burnt-on grease around the burner area, ten scrub pads and Cerama Bryte burnt-on grease remover, is a cleaner specialized in fighting against the stubborn grease stains on the stove top. It can effectively clean and remove baked and burnt on grease deposits. This product is safe to use on radiant as well as halogen cooktops. This kit has all the essential tools and is a must-have for every household. Click here to check the current price on Amazon. 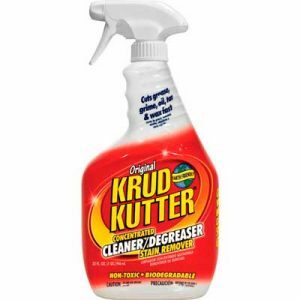 Krud Kutter concentrated cleaner/degreaser is water based multi-purpose cleaner that works on almost all types of surfaces. It’s biodegradable, non-toxic formula is safe for daily use at home. It can easily remove food stains, adhesive stains, stovetop grease and oil residues, marker, tar, wax and even chewing gum. Besides cooktops and tiles, Krud Kutter can be safely used to clean silver, brass and porcelain items, plastic toys, patio furniture, and upholstery. It’s also fabric and color friendly, so it can also be used to clean carpets. Click here to check the current price on Amazon. Also read: How to get rid of butter stains.